Sea Wave: 3 -4 ft.
An ARGO Float is a small (about 3 feet in length) black tubular shaped instrument that measures temperature and salinity in the water. It’s interesting particularly because it is so simple. The middle part of the instrument, called a bladder, is made of a thick rubber material that can inflated like a balloon. It has a pump inside that inflates or deflates the bladder which changes its volume while keeping the mass the same. A deflated state has an increased density which makes the ARGO sink to a depth of 900 meters below the surface. There it drifts for 10 days collecting data. Then the bladder is inflated so the ARGO rises to the surface and transmits its data to a satellite. When the transmission is complete, it deflates again and begins the whole process anew. This will go on for four years! As part of an international project Dr. Weller, our Chief Scientist, and a group of scientists hope to have 3000 of these in the water all over the world collecting data. We will be deploying a total of 6 at the points marked on the photo. The one you see in the photo was deployed at 2.5 ºS. 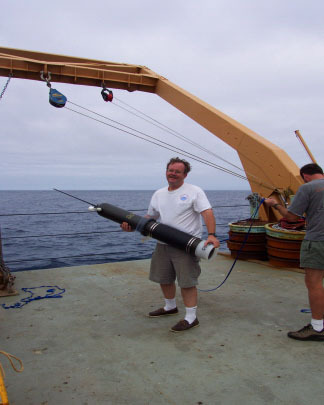 An ARGO Float is a small (about 3 feet in length) black tubular shaped instrument that measures temperature and salinity in the water. Map of ARGO float deployments. We will be deploying a total of 6 floats at the points marked on the photo. 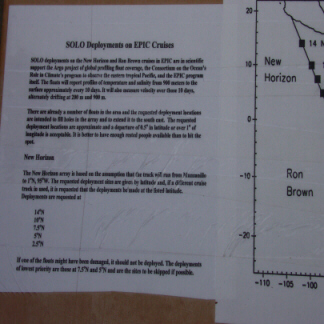 The ARGO float deployment plan. 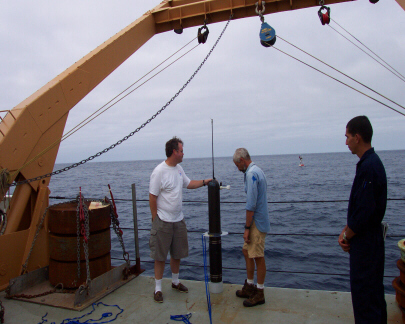 Dr. Weller, our Chief Scientist, holds an ARGO float. This ARGO float was deployed at 2.5 ºS. Pilot Whales – My first sighting of whales. So beautiful and graceful. Not good for picture taking though because they blend in so well with the ocean. The weather is fine with a high cloud cover and light winds and no rain. The crew says this is the calmest water they’ve been in all year! Lucky me! 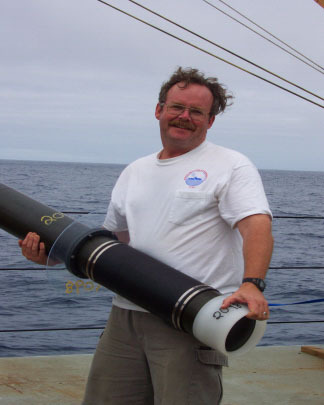 Question of the day: What would happen to an ordinary styrofoam cup at at depth of 900 m.? 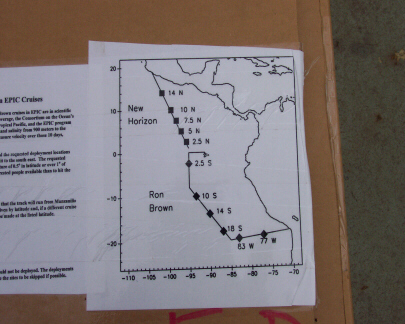 This entry was posted in 1990-2002, Jane Temoshok, NOAA Teacher at Sea and tagged ARGO float, chief scientist, noaa ship ronald h brown, pilot whales. Bookmark the permalink.